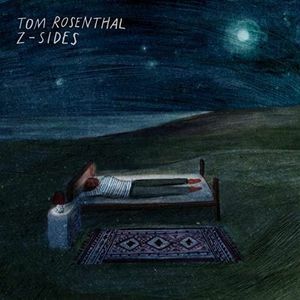 Tom Rosenthal’s Z-Sides is a beautifully and consistently calm album – the perfect record to send you to sleep (and not in a bad way)! The record was announced earlier this year on Twitter when Rosenthal posted that he wanted to make an album of songs to help ‘people sleep better’. This has certainly been achieved. Tom Rosenthal is a British singer-songwriter. He has amassed over fifty million views on YouTube, 800,000 monthly listeners on Spotify, had his work featured in TV teen drama Skins, and his song ‘Watermelon’ was listed by The Huffington Post in the Top 30 music videos of 2014. Z-Sides, Rosenthal’s fifth studio album, was released on October 26th, and features a mix of songs from previous albums as well as new ones. ‘Asleep on the Train’ soothingly introduces the listener to the record’s underlying theme of sleep. The song is about wanting a break from the pain of the world and briefly finding it in the form of a nap on a train. The guitar is cleanly finger-picked, whilst the vocals are soft and gentle. The record’s mood has gracefully been set. Only two songs on the album contain featured artists. ‘Have We Met Before’ shows off Fenne Lily, a Bristol-based singer-songwriter. The two sing in unison for the most part, making it ever more powerful when Lily’s voice soars into harmony over Rosenthal’s melody. ‘All of Them Dreams’ features the Irish Orla Gartland on a song which reminds us that most of our problems exist only in our heads. A sentiment to be cherished in the 21st century. Another important message of Rosenthal’s album can be found on ‘Busy and Important’. Here, Rosenthal introspectively sings about someone being too caught up in the workaholic attitude of the modern day world to realise that taking a break from work to find love may instead be the way to a happy existence. Some might consider ‘Watermelon’ to be a little too simplistic and minimal even for this record. It really is just a song about watermelons after all! However, the video is certainly worth checking out if you want to see the singer run and dance about the country-side in a watermelon costume. As you might expect with an album designed to help you sleep, the timbre and atmosphere remain fairly consistent throughout. There is not a drum beat to be heard and the instrumentation rarely expands beyond guitar, piano and a few layers of voice. However, this in no way makes for a dull or a repetitive album. Instead, a captivating and at times almost hypnotic tone underpins the whole work. Z-Sides really is the epitome of simple but effective.